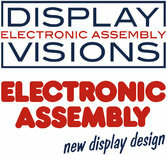 ELECTRONIC ASSEMBLY is the innovative, German display manufacturer for high-quality industrial displays. With a broad product spectrum of durable displays, ELECTRONIC ASSEMBLY serves customers from a variety of industries, from process automation to mechanical engineering to medical technology. With our own development and production, we are able to meet many needs of customers with standard displays rapidly. We produce LCD, OLED and TFT solutions, designed as bare displays or intelligent HMI also with touch panel. Due to the long-term availability (mostly 10 years), shortest delivery times (often ex stock), highest quality requirements and our excellent technically support, customers worldwide have been satisfied for more than 40 years now.